Learn about the most pressing challenges of our time — and develop the leadership skills you need to make an impact. 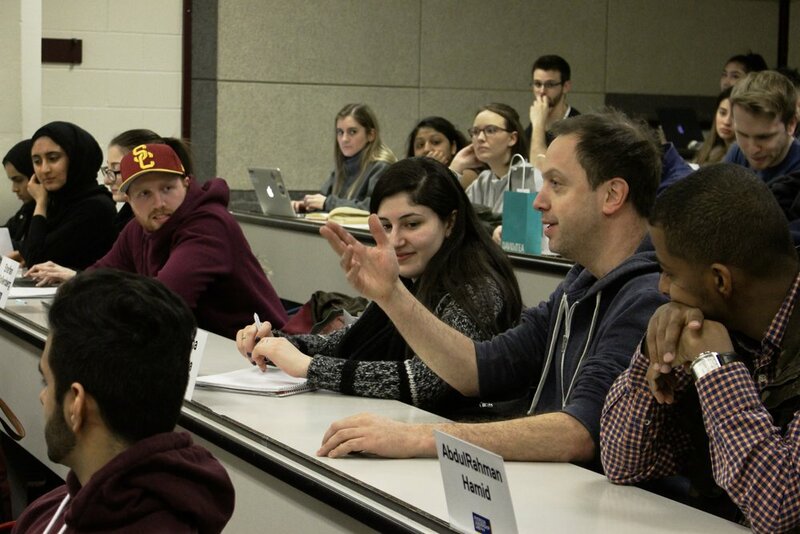 Join Karim Bardeesy, Co-Founder of the Ryerson Leadership Lab and Distinguished Visiting Professor, and weekly guest speakers for sessions that will draw on everything from music to entrepreneurship to politics to rocket science. Enrol in the course now. If the class is full, subscribe to the newsletter to hear about open lectures and other learning opportunities. Left to right: Karim Bardeesy, Deb Matthews, MPP for London North Centre and Former Deputy Premier of Ontario, and Paris Semansky, Chief of Staff to the Minister of Advanced Education and Skills Development, February 2018. Left to right: Kathleen Wynne, Former Premier of Ontario and Karim Bardeesy engaged, January 2019. “SSH 505 is a unique course. It provides a platform for the hardworking, open minded individual to be a part of a community with a common interest in disrupting the default nature of what future brings, SSH 505 has been the optimal learning experience to uplift my toolbox in being a student leader. The emphasis in valuing respect and empathy for others by the students of the class is a direct result of the culture the course creates. Moving forward from this course I have confidence in myself and the other around me to be positive, effective vehicles in making the future.